It's been 30 years since he was Pretty in Pink, and he's (still) got the jacket to prove it. 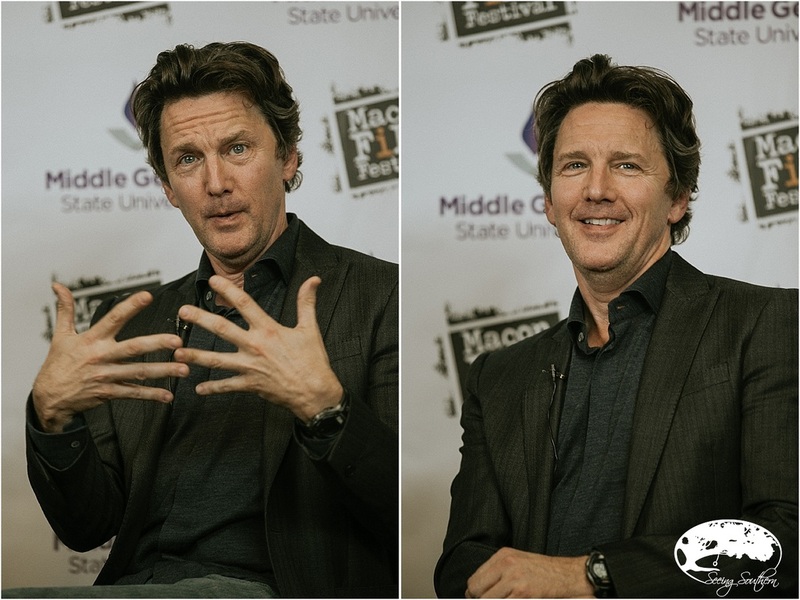 Andrew McCarthy flew into Hartsville-Jackson International Airport on an afternoon in mid-July and was whisked away by Terrell Sandefur, the face of the Macon Film Festival. According to both of them, the ride to Macon was uneventful, but Sandefur beamed - I believe he would have squealed if prompted - as he boasted about this being one of the highlights of the festival. "This was my generation," he explained. 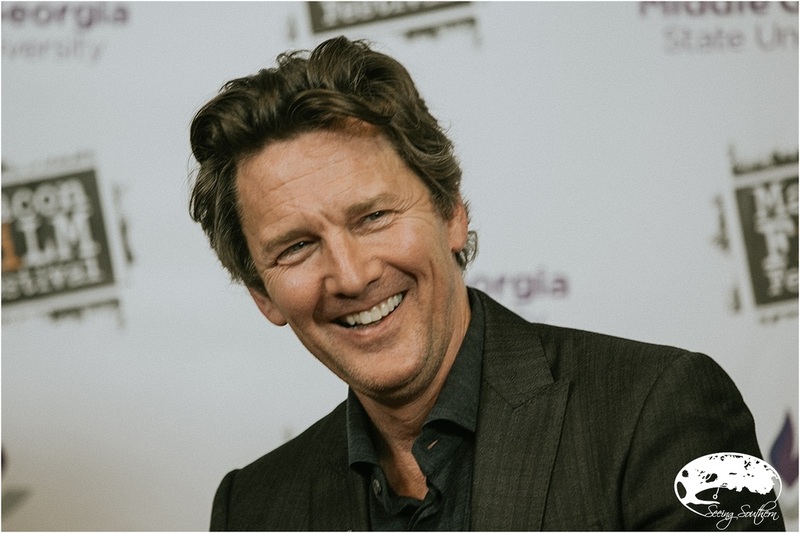 After being in the same room with McCarthy, listening to him talk in a very surprisingly unpretentious tone of his love for acting, directing, and yes, travel writing, I came to understand Sandefur's fascination with the man who stole Molly Ringwald's heart. Authentic. A man whose shoes that were much more worn than mine, whose humility exceeded his Hollywood label, whose jaded history brought him to the other side and whose smile still made women swoon. If all things were equal, being in a play is the most fun. You tell yourself you'll never put yourself through it again, day after day. It's a sense of community. The process [movies] is the same. I like something that is moving. Movies can take a long, laborious time, and just because you're good at one doesn't mean you're good at the other. Acting in front of a camera is a very isolating experience. You take turns. It's very solitary. You can make hundreds and hundreds of dollars in the theater. Heaven Help Us, which I thought was a lovely movie. Twelve people saw it! Also, Quiet Days in Clichy, a French movie, which no one saw. I enjoyed the role in St. Elmo's Fire. It captured something about me at that point in my life, and I could bring something to it. [Recently] The Family on ABC (a few people applaud). You're the one that saw it! After about 5 years [of not acting], I had forgotten how much I had enjoyed it. I really enjoyed making Weekend at Bernies (crowd erupts with laughter and applause). Oh, it's that kind of crowd. It was just so stupid. It was sort of written, but then, what if we throw him off the stage. 'Yeah, yeah, let's throw him off the stage.' [We were] Making it up as we went along. Will this be funny to other people, well, it sort of was. The first one was; the second one wasn't. I got involved because I had just directed Gossip Girl. [They asked if I would direct] For this network that no one knows about, and I can't get any real directors to do it, and no one wants to do a Netflix show, I know you'll do it. Suddenly, Netflix takes over the world! I've done [directing] about a dozen of those. I'm currently doing the first one of season five. It's like herding cats. Ladies talking at the same time, moving around, it's great! It's an original voice. People that are flawed, not blue-eyed and 98 pounds are given starring roles on television. Giving a transgender person a starring role on TV is changing the world. It's a landmark show. The first season we thought it was a really interesting show, but who will watch it and what the hell is Netflix! We were wrong about everything and since then, Netflix has taken over the world. All successful TV shows are original voices. It's funny, sad, passionate, sympathetic, cruel. It's like life. Are you endeared by the cast of oitnb? Oh my certainly! (laughing) I understand these actors. I get being an actor and the stress, what you put yourself through. You show them empathy. They know that and they relax around me. I didn't consciously step away from acting; I was writing and directing. Then OITNB became wildly successful, and it must mean 'I'm really good.' If you're associated with success, then you're better than you really are. That's the thing with acting. If you think it's really good - nothing, crickets. And movies that you don't think are anything, you're suddenly talking about them thirty years later. You just shove off and go to work and there it is. Rarely in TV does one director direct the entire series. The only variable is the guy who walks in and tells you what to do. You guys [the actors] have all been together. Only in TV does it somehow work. The boss is going to be different every week. [It was a short film which got him into TV directing.] Directing television is a funny thing. OITNB is hand directing, capturing dialogue. The Black List is very cinematic, long lens, different depth of focus. Very different kind of pieces. TV directing is like going to director gym. This week, I'm doing this; next week, I'm doing this. I'm actually in the middle of directing The Black List. [question asked regarding James Spader who was also in Pretty in Pink] I'll see Jimmy tomorrow. I'll send him your regards. He's great in it. When we were on the set last year, one of the young kids came up and said, 'Are you guys different now than when you were young.' James just looked at him in that James kind of way and said, 'We're exactly the same . . . only more so.' " [applause and laughter] That kind of sums it up. James is on his own planet. It's James' world. He's great and he's himself. Most of people have three or four jobs in their adult life, but now people have different chapters in life. I've had a 100 different bosses. Starting every day is like the first day of school, starting over again, having to prove myself. It's wonderful and a challenge. I'm still starting over. There's a new beginning all the time, but the older I get, I trust the process. The only worse thing than starting over is having nothing to do. I was lucky to discover writing when I did because then I didn't have to wait for someone to call me. I have to do that every day to feel good about where I'm at. I'm glad I have different things. Like in the morning, I'm writing. In the afternoon, I'm editing a show I just directed, and in the evening, I'm running lines for a show. That's a great day! If I had one thing all the time, I'd go crazy. There are times in life when I didn't want to, now, what else you gonna do? Challenges are usually just fear; it masks itself in all ways. As a younger actor, my greatest influence, Montgomery Cliff, his style of acting. Directing, Roman Polanski. He told the story really well. His personal life was another story. I have mouths to feed (laughing)! I find an idle mind is the devil's workshop. I like to have something I'm working on. I like to have a writing thing I'm always working on. I walk down the street, and I'm thinking about characters, think about plays. Being creative all the time is helpful to the way I operate through the world. If I keep switching, then everything is fresh all the time. I like that feeling. I feel very lucky that I found things I love to do and am allowed to do them. I would have certainly told myself to make more - like everything else, this business is like every other business - relationships. I was never interested in relationships because I'm much more of a solitary person. I was not interested or I was uncomfortable going out and cultivating relationships or networking, as it were. That's the business and how you succeed. I still tell myself that, and I still struggle. That is the key. If it's purely business, don't worry. It's all going to be fine. If you're a freelancer, at the end of this job, [and] there's nothing, then what happens. Something has always come up to meet you, but the fear is [that it won't] . . . Now, it's less. Don't worry; something will show up. If you have that kernel inside of you that wants to be an actor, you have to try it. It doesn't go away. I've met so many people that come up to me and say, 'When I was young I wanted to be an actor.' I look into their eyes [and say], 'Don't listen to grownups.' I remember my father telling me 'No son of mine is going to be a fu***** Thespian.' The minute I was doing a movie with Jacqueline Bisset, he told me to bring her home for dinner. In my other life, I'm a travel writer. To me, they are all the same, just another version of storytelling. What I loved about writing . . . I have an idea, I start writing. I feel useful during the day. It was a huge relief. As an actor, you're always waiting for the phone to ring, and after years of that, it gets old. When I started writing, the acting helped because dialogue moved the story forward and character and pace are important. It all happened the same way in a sense [all experiences]. It was just a passion I had. Travel changed my life. Travel became the university for my life. I just began writing about it because I felt I had something to day. America is a great county, but it is also a fearful county in lots of way. If we traveled outside of American, we would learn a lot of our fears are misplaced. I jokingly say I'm out to change the world, one trip at a time, but it's no joke. Thirty-five percent of us have passports and only have of us use them. If that were double, I think our country would change. We would stop being fearful. "You should let me write for your magazine." "Yes, I know that but I can also tell a story." He thought that was good. Always tell me a story; don't sell me a destination. I usually keep writing separate. Only just now do I feel relaxed about both [screen and writing] to intermingle something. I'm working on a couple of things. McCarthy's 2012 New York Times Bestselling memoir of travel and discovery. From New York to Patagonia to the Amazon to Osa to Vienna to Baltimore to Kilimanjaro to Dublin, his journey "to have me so I can have us." I will confess, I am shocked at the life of Pretty in Pink. When we were doing it, at the time, I thought, 'I don't want to be in this movie.' I hadn't even read the whole movie. I thought it was a silly movie about a girl wanting to go to a dance who makes a dress. You know something - it really captured something about a generation. Those movies gave credence to young people's struggles, problems in a way, we took things more seriously. Everything is so important. I have to have the right dress to wear to the thing or my life is over. The movie validates that feeling as opposed to parents saying 'Oh, come on!' To take you seriously, that's a powerful thing. The music is a big deal. Real genius. I was surprised when it came out that it was so successful. I didn't have an emotional attachment to it; over time it has become this other thing. It's like another arm. I have grown to have great respect and affection for it. John wrote and produced, but didn’t direct. My main memories of John were that he was a lovely man. He wrote Pretty in Pink in a weekend. He was a burst of energy. I went over to his house. and we rehearsed. I wasn’t what he wrote for the part. It was originally a hunky, jock kind of stud on campus, square jaw big football player. I had just done St. Elmo's Fire. They said, 'He’s not right for it. He’s sensitive. He’s not enough.' Okay, but he can audition. Molly Ringwald was in the room, and I read with her. I walked out and Molly said, 'That’s the kind of guy I’d fall for.' John said, 'Really? That wimpy guy? Okay.' And he hired me, and he rewrote and adjusted. Everyday he would sit on the set [about lunch time], with a cassette recorder. He’d play a few bars. It would eventually become the soundtrack. He had a great ear for contemporary music. He had what the movie had, respect for young people, what they had, what they were going through, what they could relate to and what they found important and attractive. It wasn’t necessary what he was thought, but he was interested in and wanted to know. It's just part of my story. At the time, we hated the term. It was a jarring time. NYMagazine was following Emilio Estavez around, doing a story, and he [Emilio] had the bright idea to take the writer out with him drinking with Judd Nelson and Robb Lowe. Drinking at the Hard Rock Cafe. The writer thought, 'who were these f****.' All these young women came up to them, and this writer was a little nerdy, geeky guy and nobody's paying attention to him. So he's getting an example of these young hot dudes and this perfect life and he was really resentful of that. He wrote this really nasty article 'Those three guys: the Brat Pack' - a nasty condemnation. I was condemned as well. Then we did all these movies and we were lumped together. We all tried to run from it in our various ways. You just give up. It's like a third arm, and at the end of the day, it's been very good to me. It will be on my tombstone. I have that beige linen suit, actually it was just a jacket. I absolutely do. I don't wear it anymore. It's the only piece of wardrobe [I have] that and a shirt from St. Elmo's Fire. That's it. I hit the jackpot in my 20s that had wonderful and detrimental effects on my life. Who knows what's going to be good and what's not going to be good. I've often said, 'I wouldn't wish success on anyone under 30.' It altered my life in a way I can hardly comprehend. I was 22. It defined who I was growing into a man. I would have been an entirely different person had I never been selected at an open call to be in my first movie. We can never know. There it is.